In order to play you will need to get a set of 50-100 of some kind of tokens. You can use pennies, glass beads, playing cards, whatever, or the game has alternate rules to let you play without them. i.h.e is available as a no-frills print-and-play game, or as a fancy print on demand product through DriveThruCards. 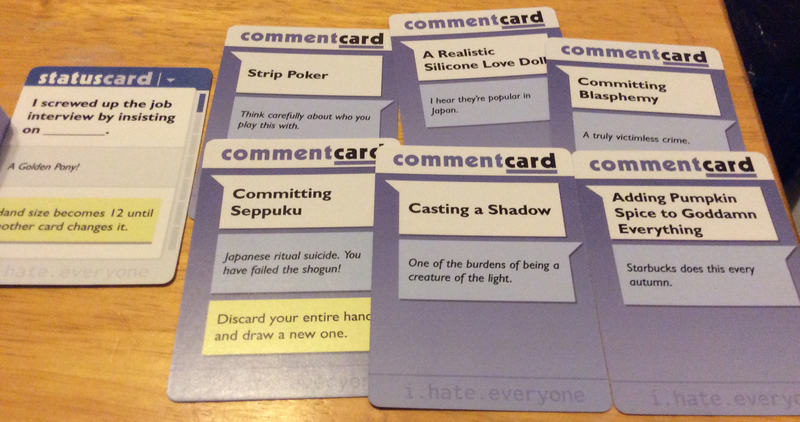 This is the base set of i.hate.everyone, which includes 100 Status Cards and 280 Comment Cards, everything you need for hours of shameful fun. i.hate.fandom is an alternate base set for the game with an emphasis on geeky stuff. It follows the same rules and everything, but has cards about memes, My Little Pony, Star Trek, Game of Thrones, anime, video games, and so on. You can play it as a separate game, or combine it with the base set to make one giant, unwieldy (but fun) monstrosity. 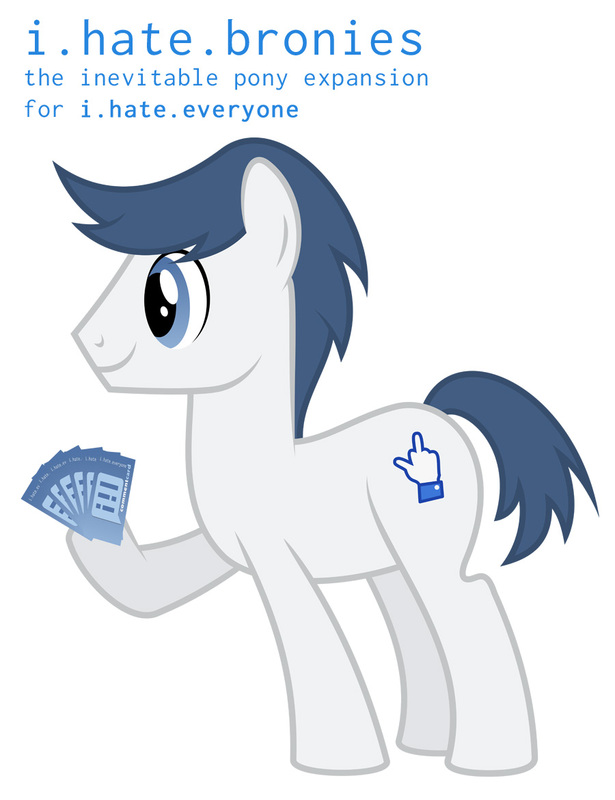 The i.h.e “Custom Pack” is Creative Commons licensed set of files to allow you to create your own i.hate.everyone cards, and even to sell them yourself. It’s an Attribution license, so you just have to give credit, but you can make and sell stuff however you like otherwise. 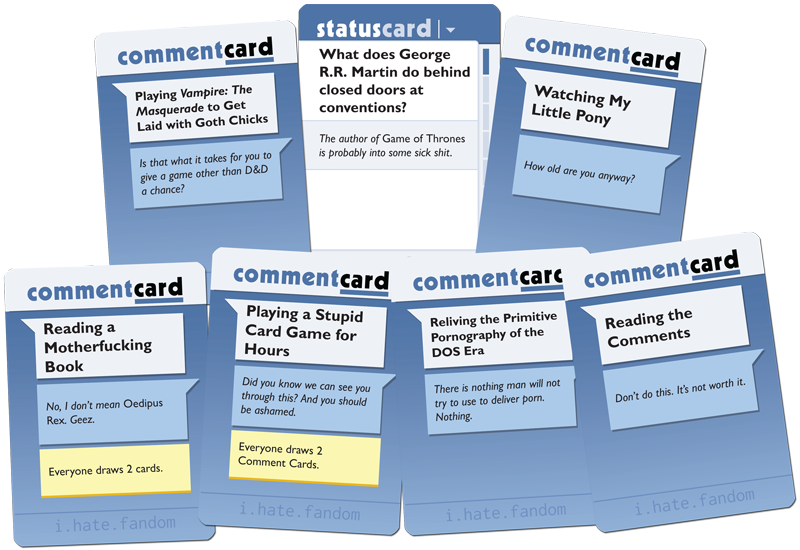 i.hate.gimmicks: A collection of cards with goofy rules gimmicks, including more stupid tricks, funny voices, rolling dice, and even new Status cards that call for each player to play two Comment Cards. I have way, way too many other ideas for expansions. If there’s something you’d especially like to see let me know! 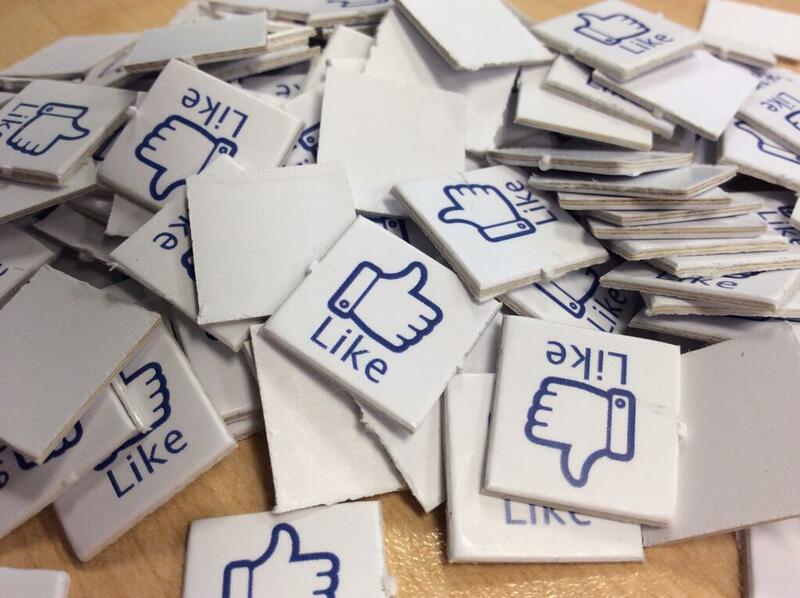 You can use just about anything for Like tokens, but if you would like semi-official looking ones that actually say “Like” on them, here’s a way you can get some. Download the PDF below, and use it to order a full sheet of 5/8″ Square Game Counters from Superior POD, which will cost $5.99 plus shipping.